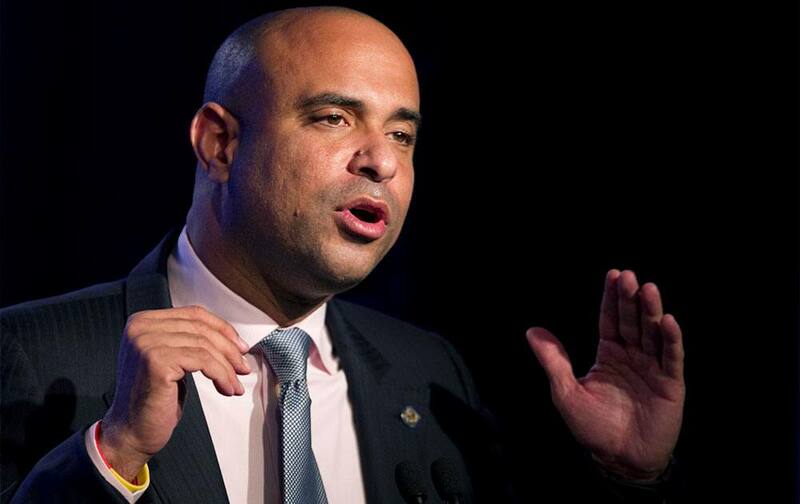 Laurent Lamothe, prime minister of Haiti, participates in the panel discussion "Expanding Cross-Sector Coordination in Haiti" at the Clinton Global Initiative in New York. 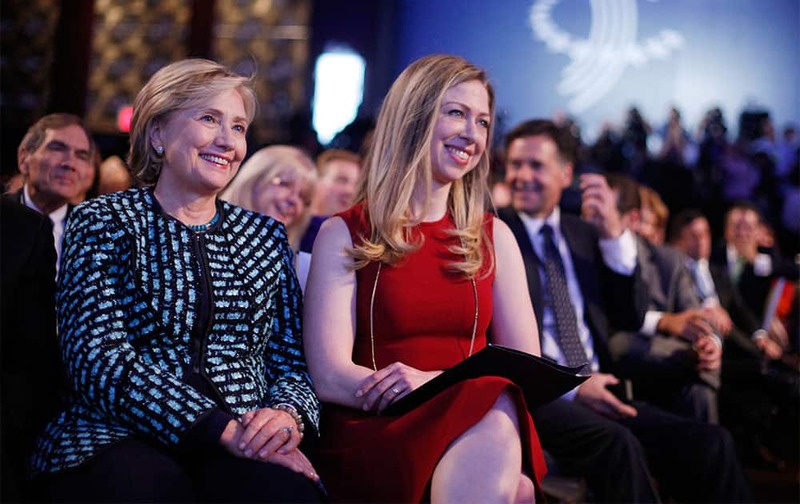 Former Secretary of State Hillary Rodham Clinton, left, and her daughter Chelsea Clinton, center, listen to President Barack Obama and former President Bill Clinton speak at the Clinton Global Initiative in New York. 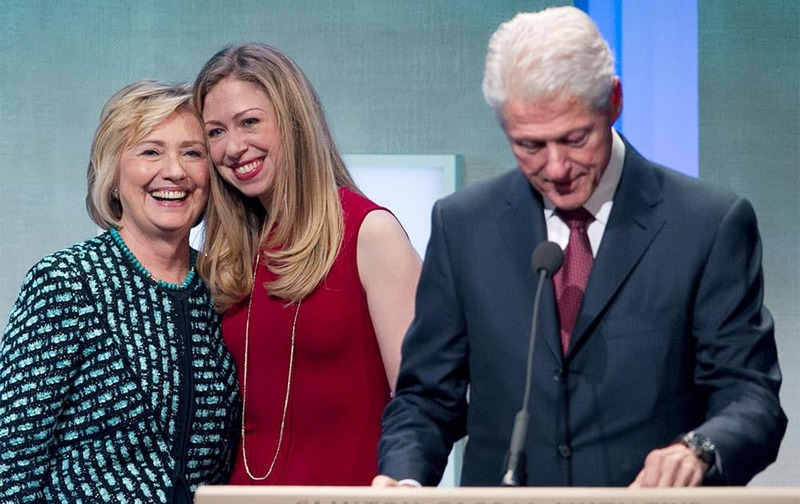 Former President Bill Clinton prepares to make remarks at the Clinton Global Initiative while his wife, Hillary Rodham Clinton, and daughter, Chelsea, take the stage with him, in New York. 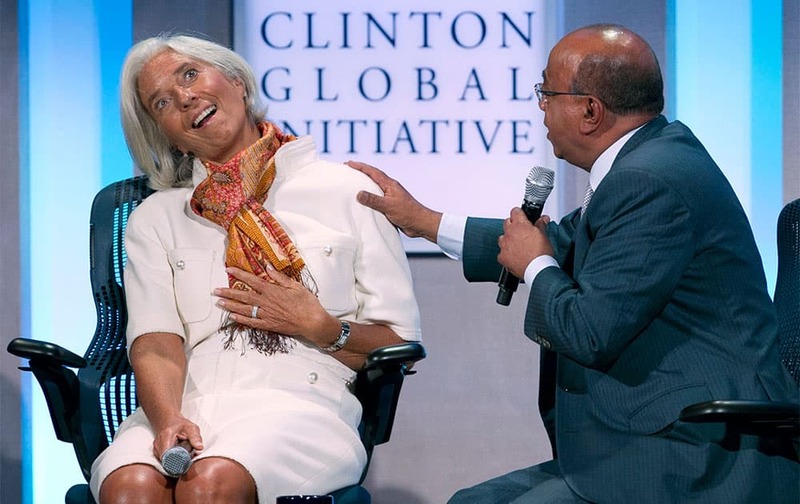 Christine Lagarde, left, the managing director of the International Monetary Fund, reacts as Mo Ibrahim, founder of the Mo Ibrahim Foundation, suggests that the next IMF director not be French, at the Clinton Global Initiative in New York. 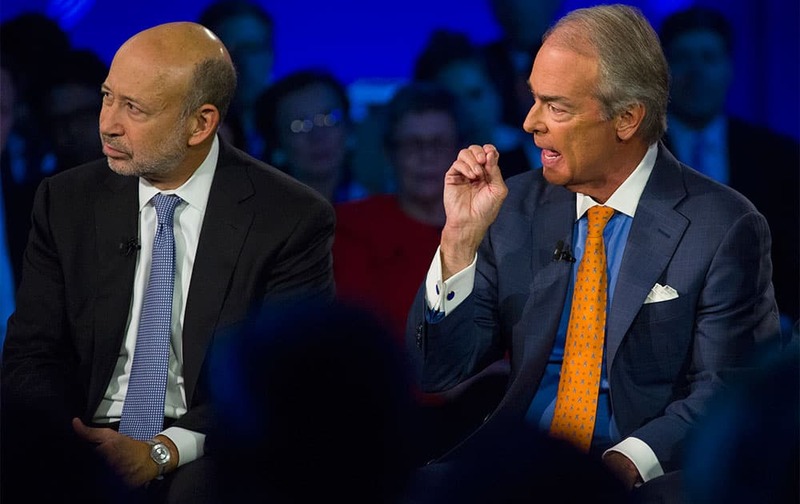 Lloyd Blankfein, left, Chairman and CEO of Goldman Sachs, and Jim Rogers, CEO of Duke Energy participate during the panel discussion "Creating Long-Term Value in Emerging Markets" at the Clinton Global Initiative in New York. 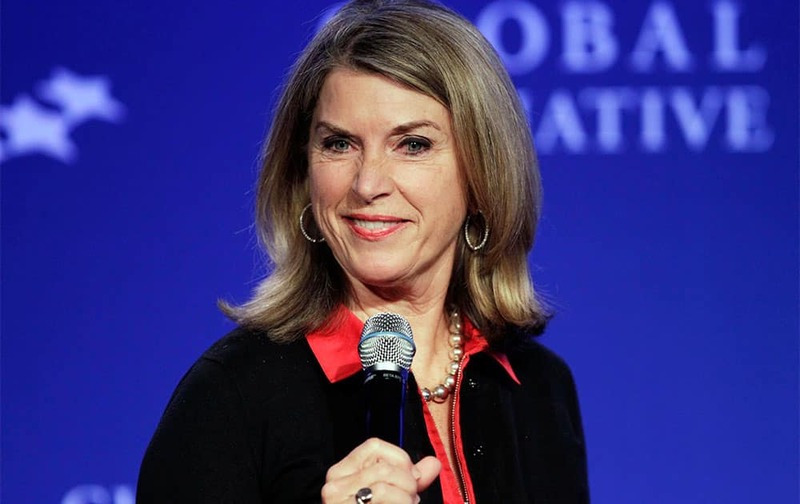 Kathleen Matthews, executive vice president of Marriott International, moderates the panel discussion, "Expanding Cross-Sector Coordination in Haiti" at the Clinton Global Initiative in New York. 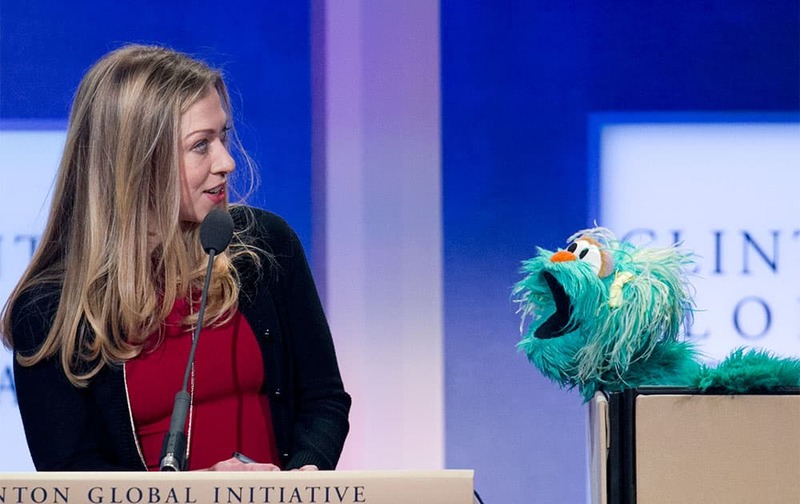 Chelsea Clinton, left, reacts to Rosita, a character from Sesame Street, at the Clinton Global Initiative in New York. Clinton moderated a panel on "Healthier Futures: Prioritizing Prevention" and Rosita was an invited guest. Vice President Joe Biden kisses former U.S. Secretary of State, Hillary Rodham Clinton, as he arrives at the Clinton Global Initiative`s Citizen Awards Dinner in New York. 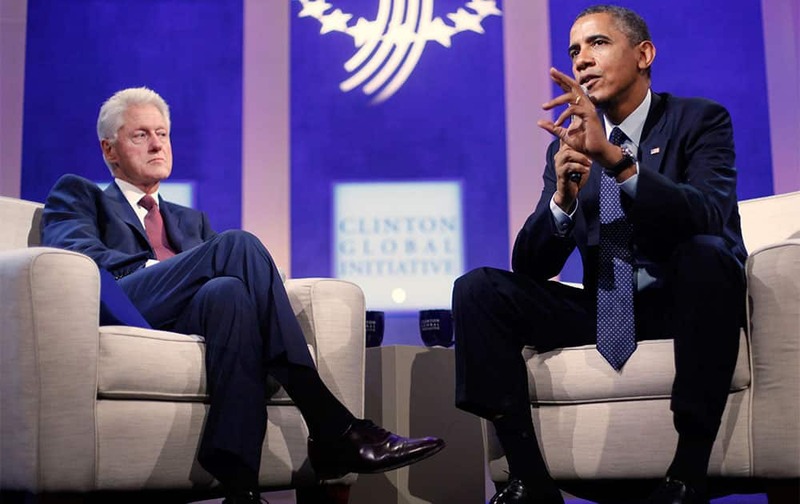 President Barack Obama with former President Bill Clinton speaks at the Clinton Global Initiative in New York. 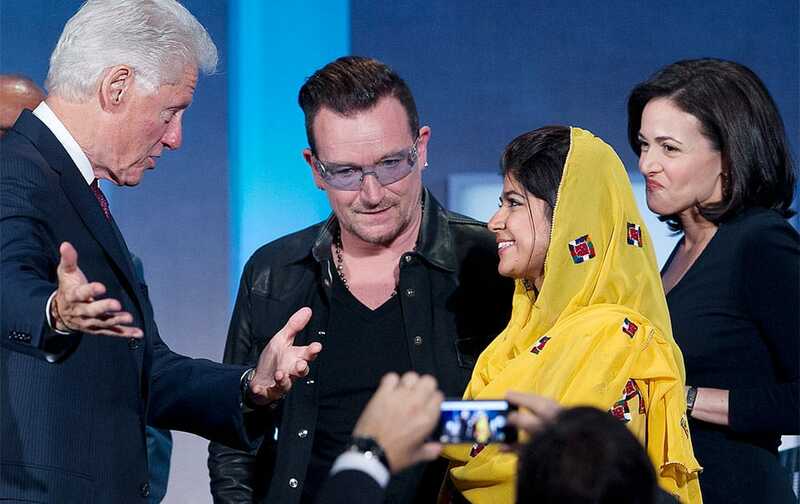 Former President Bill Clinton, left, talks with Bono, Khalida Brohi, founder of the Sughar Empowerment Society, and Sheryl Sandberg, the chief operating officer of Facebook, at the Clinton Global Initiative, in New York. Clinton moderated their panel discussion on "Mobilizing for Impact." 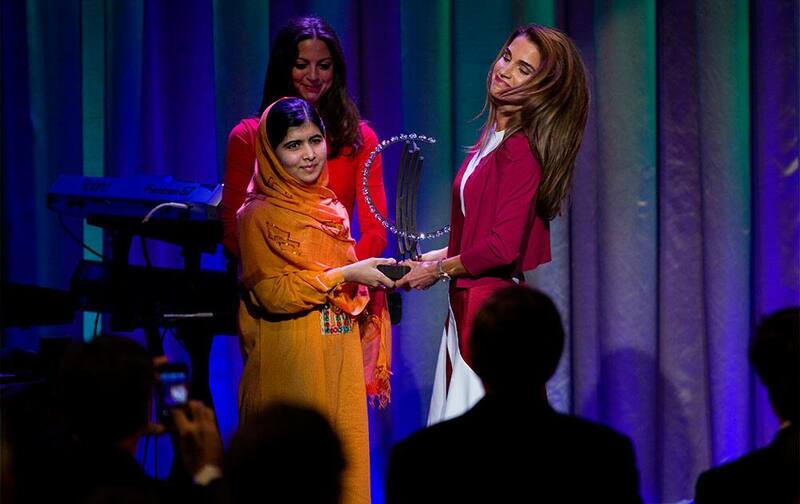 Malala Yousafzai, the Pakistani teenager shot by the Taliban for promoting education for girls, is given Leadership in Civil Society award by Queen Rania of Jordan at the Clinton Global Initiative`s Citizen Awards Dinner in New York. 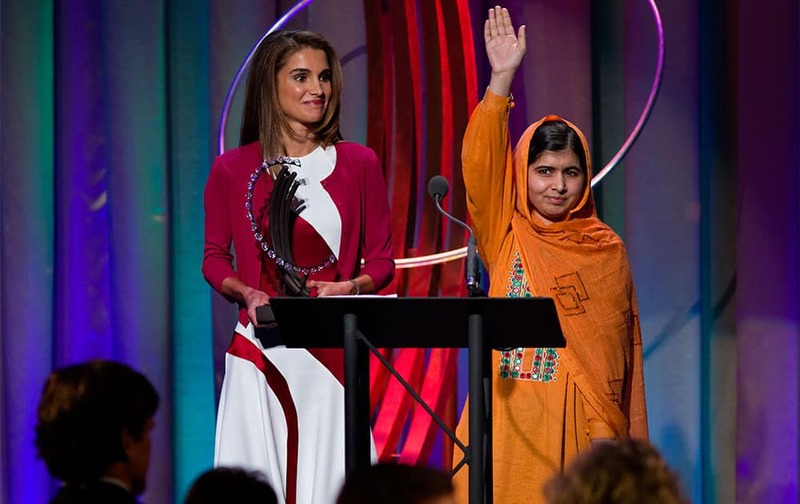 After speaking to attendees, Malala Yousafzai, the Pakistani teenager shot by the Taliban for promoting education for girls, waves to the crowd after receiving the Leadership in Civil Society Award from Queen Rania of Jordan, left, at the Clinton Global Initiative`s Citizen Awards Dinner in New York. 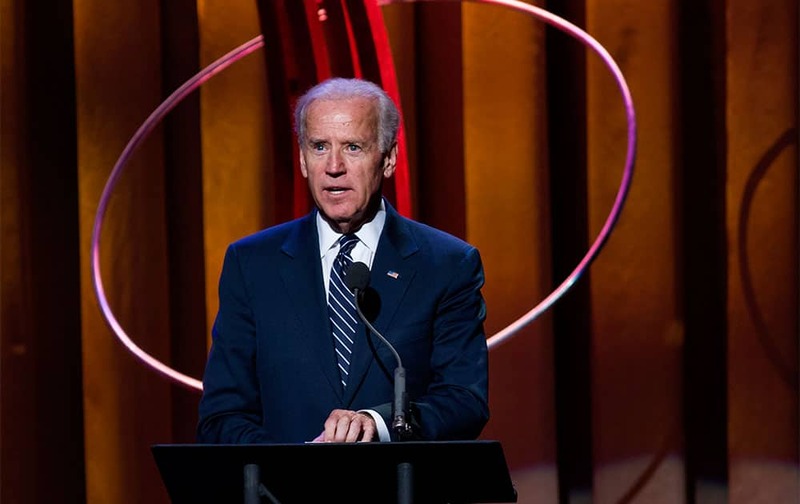 Vice President Joe Biden speaks at the Clinton Global Initiative`s Citizen Awards Dinner before presenting an award, in New York. 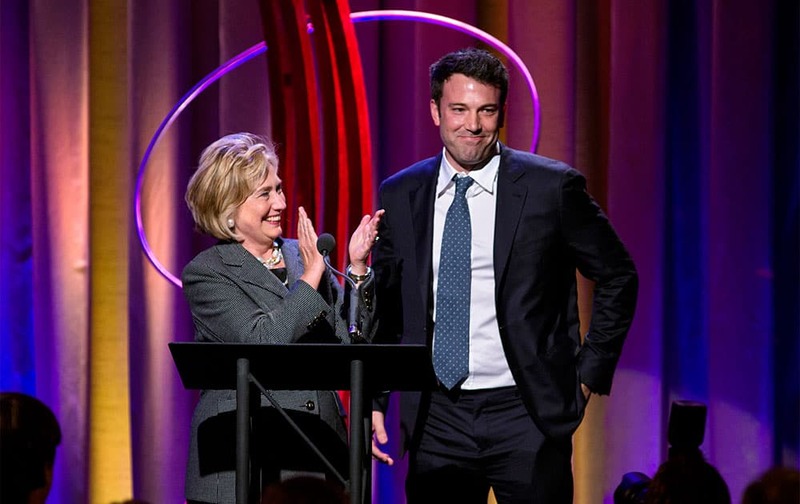 Former Secretary of State Hillary Rodham Clinton applauds actor Ben Affleck, right, during the Clinton Global Initiative`s annual awards in New York. Clinton and Joe Biden appeared together during the event. 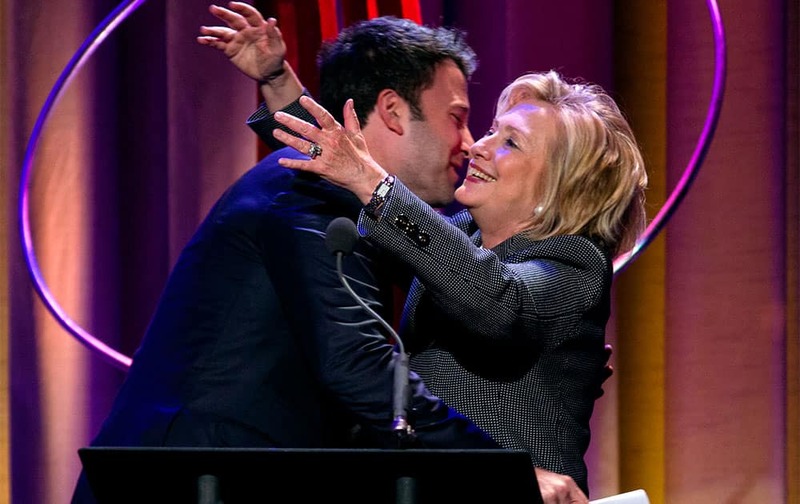 Former Secretary of State Hillary Rodham Clinton embraces actor Ben Affleck at the Clinton Global Initiative`s Citizen Awards Dinner in New York.